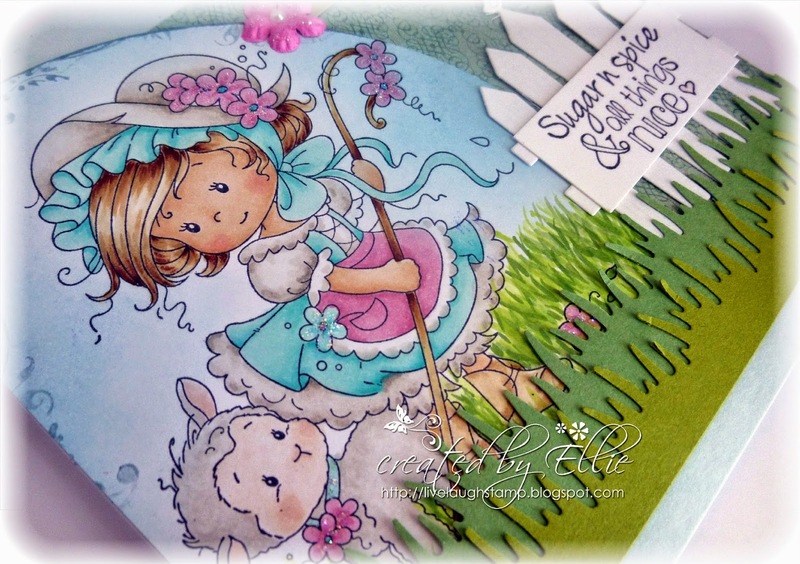 I have a card to share today which I made for the new Whimsy Stamps Facebook challenge. This month we'd like to see things that sparkle. I hope you'll join us. As always we have a fabulous prize to give away to one lucky winner! You find all the details on how to play along HERE. I used one of the new stamps from Whimsy's Wee stamps collection - Mary. Of course I had to have this stamp because my daughter loves anything sheep. The image has been stamped onto copic xpress blending card using Memento tuxedo black ink. I colored it using copic markers. 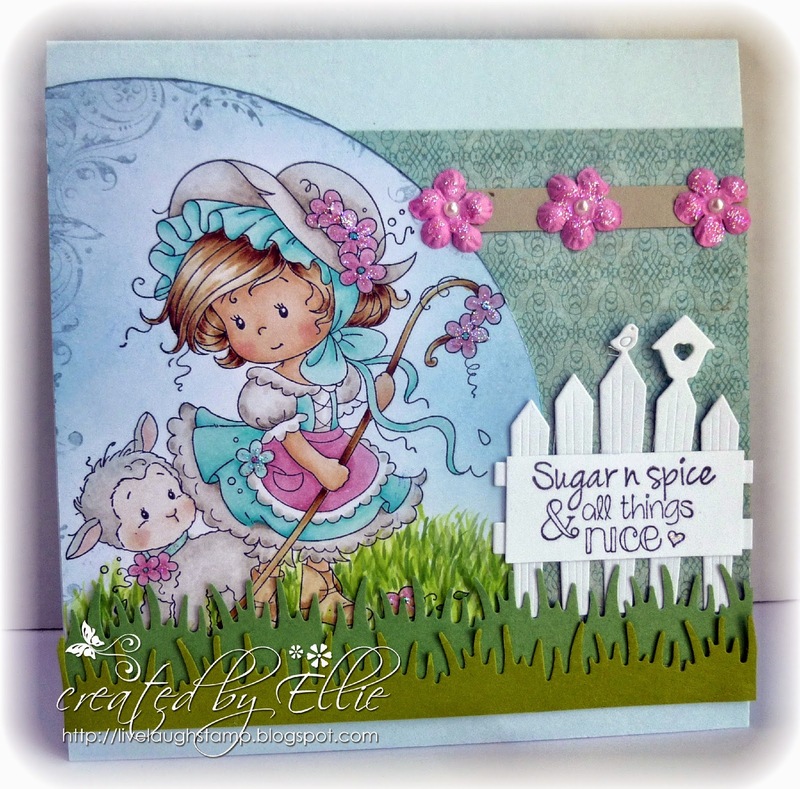 I also used a Whimsy Stamps sentiment from the new stamp set "Girl Talk" by SC designs. The little white picket fence was cut out using Whimsy's Picket fence die. A Martha Stewart punch was used for the grass border. I added a few flourishes around the image using one of my most used stamp sets "Lavish Flourishes" from Whimsy. Designer paper is from MME, flowers are by prima. I added some sticky pearls to the centers and glittered all the flowers using stickles. Before I go I wanted to share a cute photo. The other day we planted a fairy garden. Thought it would be fun to add a couple strawberry plants. Someone else thought it was a good idea too! The little stinker ate all the berries!! Of course he loves chewing the grass we planted into the fairy garden. (Can you see the bunny in the back? 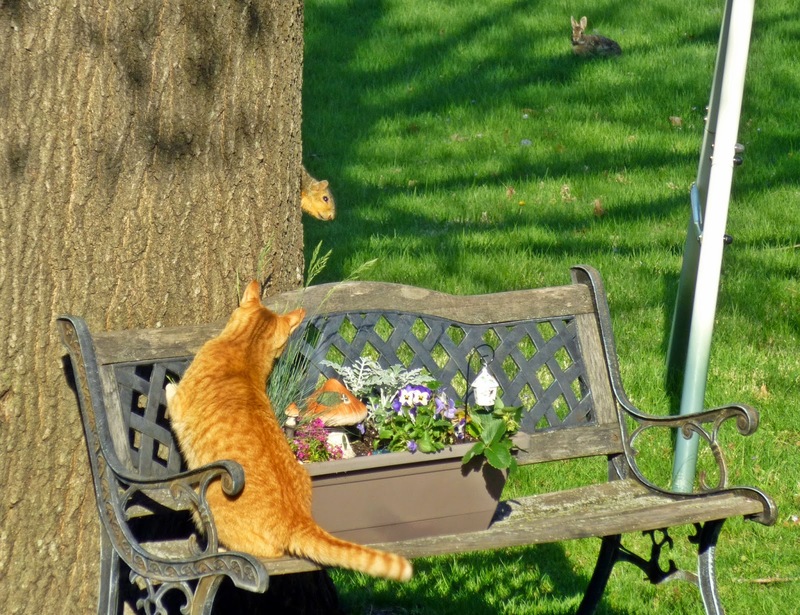 He seems to be very curious watching what's going on between Thomas and the squirrel LOL). This is so pretty, I love the image you’ve used and the embellies too. Cute photo's. You are a early bird, thanks for joining us at Challenges 4 Everybody, would love you to visit my blog and be in the running for some delicious candy. Only 4 followers away before I make the draw for the beautiful frame die from Sherri Ann Baldy. Your entry in our challenge is fabulous, you are very creative. Thankyou for joining us. A great creation for our challenge Ellie, thanks so much for sharing your lovely work with us at Stamping Sensations challenge. Such a pretty card, I love Sylvia Zet's images. 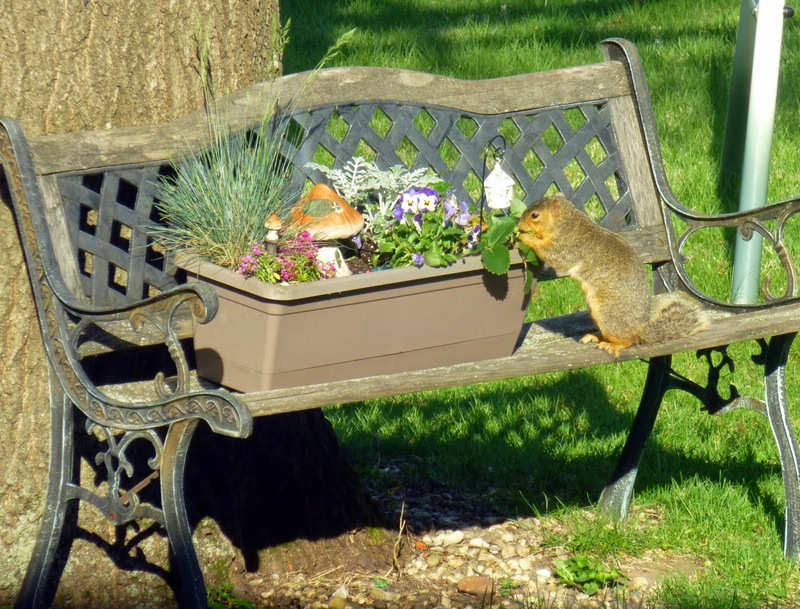 And as for that cheeky squirrel.....great photos! Beautiful card Ellie that image is a pure delight to see, loving the pictures. What a sweet card. I love the little scene you created. What pretty garden pictures. So cute and sweet. I was just outside admiring all the spring birds that have arrived for the season: the orioles, bluebirds, and rose breasted grosbeaks. Such a symphony of color! I love spring! this is a very sweet card, beautifully coloured and i love the fence. Absolutely adorable, Ellie, and so beautifully coloured. Thank you for sharing it with us at Stamping Sensations this month. ooh this is so cute and love the colours. Great photos you shared too!